Google AdWords Negative Suggestion Tool: Useful? Visible? Home > Google News > Google AdWords > Google AdWords Negative Suggestion Tool: Useful? Visible? 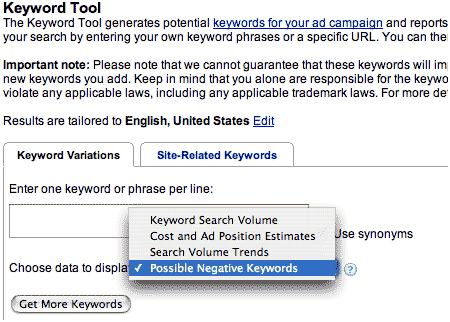 In a Search Engine Watch forums post, AussieWebmaster asks if anyone is using the Google AdWords negative keyword tool and whether it is useful or not. As Barry wrote in an earlier post, Google is giving the negative keywords tab, which has little exposure and use at the present, more visibility. I used it last week. Personally I don't think much of it . I entered 5 keywords as suggested but it didn't give me anything. I continued to add keywords and eventually it spat out a negative keyword - but nothing very impressive. I have been using this for a while. It is an excellent tool! In most cases I run it in an ad group, add a bunch of negative keywords then run the clean sweep function to add them as campaign negative keywords. Do you have it? Do you think it's effective? Did you even know about it? Previous story: Does Rotating Content Hurt Your Search Engine Rankings?